These are the first popovers I’ve ever made in my whole life. 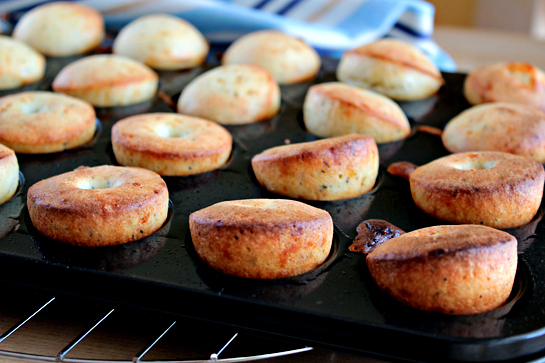 I hadn’t known much about them before… just until the day when I noticed a gorgeous post over on Tracy’s blog where she, as I see it, convinced all people of this planet to make their own popovers immediately. Because there’s just no other way they can keep on living their lives. That’s how delicious Tracy’s recipe looked. So I gave them a try. And liked them a lot. At first sight, they might seem like a drier kind of bread thing, but they are not. They are moist, light and airy… like puffed up savory pancakes. But most of all, they are amazingly tasty. 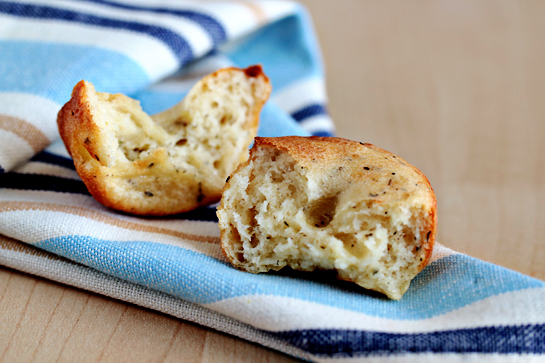 Their flavor is a perfect combination of cheese, thyme and oregano goodness. And there’s also a little bit of black pepper involved which really does the trick. And the fun part? You need no fancy popover pans. 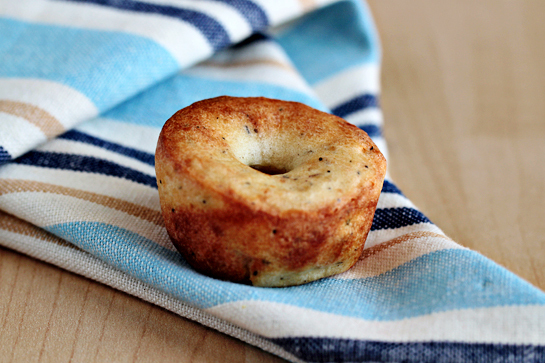 These were prepared in a mini muffin pan and it worked out perfectly. 1. 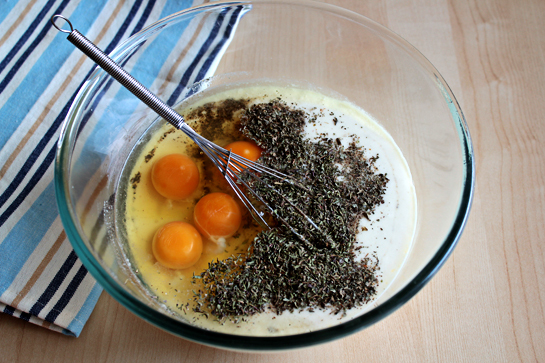 First, in a larger bowl, mix the milk, eggs, flour, 2 tbsp (30 grams) melted butter, salt, pepper and the herbs. You can see a bit more herbs in the picture above. I was in a very generous mood when I was making my first batch, I admit. I made them again the other day with less herbs, and that tasted better. 2. 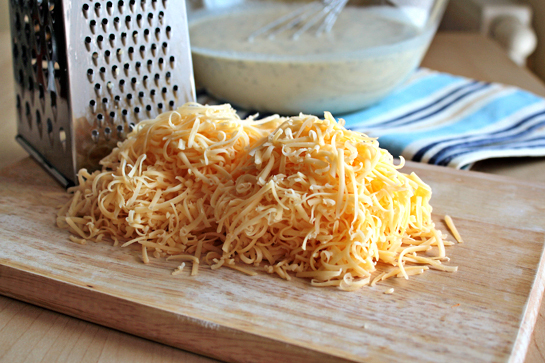 Then add the cheese, mix to combine and place the bowl in the fridge for about one hour. I used Edam cheese because that’s what my fridge gave me, but you can use any cheese you like. 3. After one hour, preheat the oven to 425 F (220 C) with the rack in the upper third (!). 4. 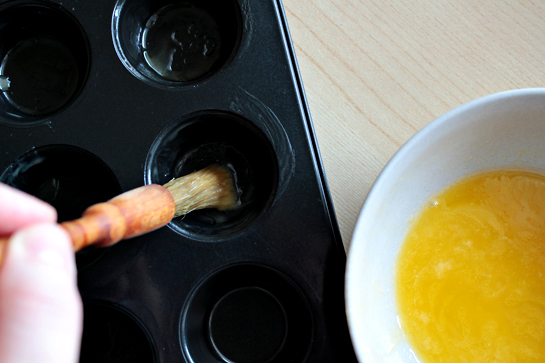 Melt the remaining butter (2 tablespoons – 30 grams) and use it to butter the mini muffin cups. 5. Place the muffin pan in the oven and heat it until the butter sizzles (about 2 minutes). 6. 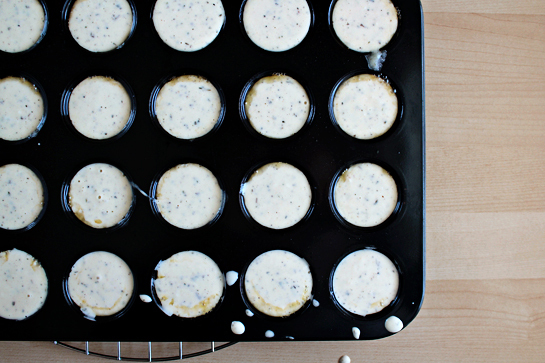 Then remove the pan from the oven and fill the cups with batter. 7. Pop the pan in the oven again and bake for about 15 minutes or until puffed and golden brown. I was staring in the oven for all the time they were in. It’s like watching magic happen right before your own eyes. I liked them best the next day. 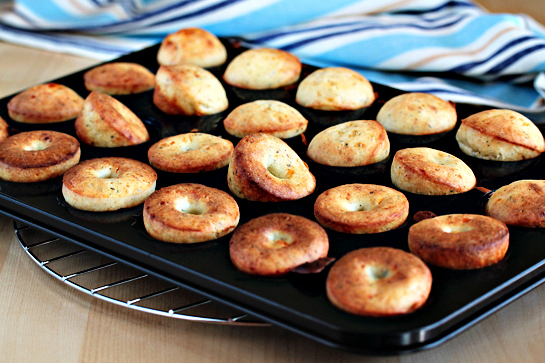 And, by the way, are you popover fans? And if so, what flavor is your favorite? Do tell! Tak toto zrejme vyskusam,vyzera zaujimavo ako ranajkova alternativa;) A ako sa popover vlastne prelozi do slovenciny? I made them! Amazing taste! Thank you so much! This has become my favorite food! Dear Petra, what a wonderful blog! I MUST make these! But I don’t have a mini muffin pan…Do you think it’ll work if I use a regular size muffin pan and let them cook for a bit longer? Hi! Thanks for all your recipes! I have been using it for more than a year now. Easy to make and delicious! 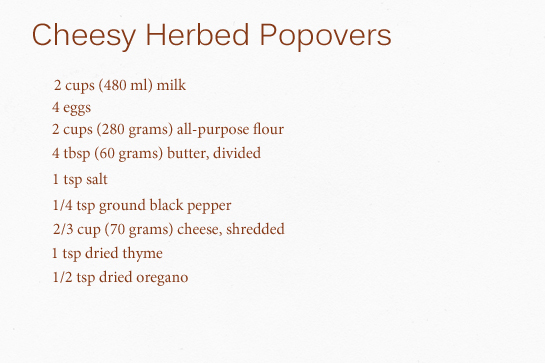 This popover recipe, I have tried it several times and this is how it turned out http://megamenogame.com/easy-make-cheesy-herbed-popover/. I also tried it with paprika powder and I think it is good too!